Oprah Winfrey feels a new freedom after leaving her wildly successful daily TV talk show behind and taking a new course seeking interviews with newsmakers on their own turf. “I love the freedom of not being tethered to that chair and having to do an interview based upon filling a quota on a number of shows,” Winfrey told Reuters in South Africa, where she will attend at the weekend the first graduation of high school seniors from her Oprah Winfrey Leadership for Girls. Less than a year after she ended “The Oprah Winfrey Show” in May after 25 years on air, Winfrey launched the once a week “Oprah’s Next Chapter” in January on her fledgling cable TV channel OWN. “When you have 200 shows a year to do, you do a lot of things that you like and a lot of things you would, maybe, want to pass on,” she said on Thursday. Winfrey has interviewed Aerosmith leadman Steven Tyler for the show and visited Sean Penn in Haiti to see what he is doing to help relief efforts in the impoverished country trying to rebuild from a devastating 2010 earthquake. “Oprah’s Next Chapter” has brought the best ratings ever for the Oprah Winfrey Network which has struggled to find an audience. OWN said 1.6 million people watched Oprah chat last Sunday with U.S. televangelist Joel Osteen — a 220 percent increase on the audience in that time slot a year ago. The show will soon take her to India, and China is also in the cards. “Part of this for me is getting to do exactly what I wanted to do when I ended ‘The Oprah Show’. Winfrey said she misses bantering with her live studio audiences and seeing their reactions to shows as they unfolded. “For years, I could tell how something was landing or being received by looking at the faces of the people in the audience,” she said. Winfrey, who spent millions on the sprawling campus near Johannesburg on the school for girls from disadvantaged background, believes her new show could be a springboard for philanthropy. Winfrey, who has met anti-apartheid icon Nelson Mandela several times during visits to South Africa, said she would like to visit the former president during this trip. Mandela, 93, and often called by his clan name Madiba, has had few visitors since he suffered a respiratory ailment last year that sent him to hospital. “I try to see Madiba each time I come. 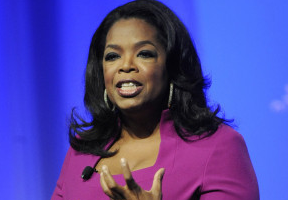 If he is able to see me, yes, I will (see him),” Winfrey said.